Best Rechargeable Nose Hair Trimmer -- Premium Quality Stainless Steel Won't Break! Lifetime Warranty and 100% Money-Back Guarantee of Satisfaction! When you want the job done right, you can't possibly rely on those cheap battery-operated plastic jobbies to get the job done. To look your best - and avoid the snags and painful tugs you get from cheap trimmers - you should only rely on the Schön "3-In-1" Ear Nose, and Hair Trimmer - available exclusively here on Amazon through EZ Innovations. It's a "3-In-1" model - which means it can be used to trim ear hair, nose hair, and sideburns equally well! Most other trimmers cannot make such a claim. But the Schön "3-In-1" saves you money by eliminating the need to buy a separate tool! And since the Schön "3-In-1" is such high-quality design and construction, it will last a lifetime! 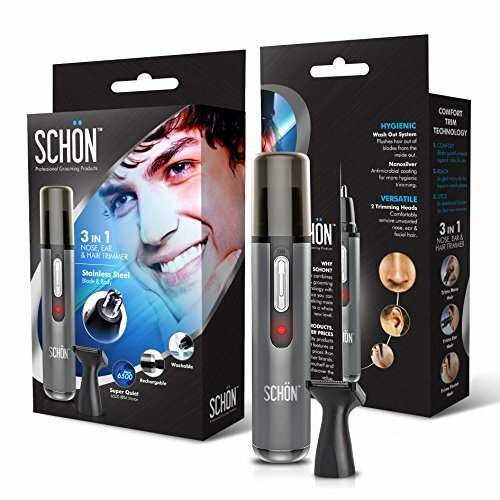 It even comes with EZ Innovations exclusive 100% Money-Back Guarantee of Satisfaction: If you don't think the Schön "3-In-1" is the BEST ear, nose, and hair trimmer you could possibly buy, please return it and accept a FULL REFUND with our sincere apologies. We aim for Complete Customer Satisfaction. We're totally confident you'll love the Schön "3-In-1" - or we wouldn't be able to make this generous guarantee. We'd go broke! So don't hesitate to ORDER YOURS TODAY.